The blockchain is a technology that has been revolutionary more than evolutionary! It has changed the perceptions of cornerstone-aspects like security – it’s a rare confluence where security and transparency – considered two polar opposites, coexist peacefully! The existence of smart-contracts, a self-executing compliance system, has elevated the utility of blockchain to never-before-fathomed zeniths. The number of the insured and the number of insurance policies have been increasing proportionally to the market. The types of products and entities being insured are increasing in line with the marketing. This has made the equation of insurance claims complex, rendering the process cumbersome. It takes weeks or even months to process a single claim, and the time doesn’t guarantee the immunity from human errors. Since this process consumes resources in both human and temporal forms, the premiums tend to be relatively high. Introducing smart contracts in insurance claims not only automates the process but also makes it swift and accurate. The smart contract can contain certain input-conditions which can be programmed to change in the event of a catastrophe, and the claim-process can be triggered automatically. There are certain quantitative parameters that can measure the intensity of a catastrophe – the wind velocity or the magnitude of an earthquake. If these pieces of information can be channeled into a blockchain, the crossing of a certain predetermined threshold can trigger the execution of a claim. The claim-amount gets processed with the utmost swiftness with minimal human intervention. Bringing in some historic data can further increase the speed and even automate the fixing of thresholds – like hurricanes in Florida and earthquakes in California. Smart contracts reduce the administrative expenses, while still upholding the values of transparency and trust – thanks to its decentralized nature! Great content, be it music or a video or even an article, is quite an oxymoron. The greatness of the content is determined by the magnitude of reach and retention, but at the same time, it has to be done in a way where the original creators do not lose their credit – both in terms of money and recognition. If we take the music industry for example, either the artist or the label holds the rights to the content. They are entitled to receive a royalty in every instance of their creation being used for commercial purposes. Since there are multiple layers involved in channeling the royalty amount, it is not always assured that all the legally entitled receive their royalties. At this juncture, the smart contract’s utility comes to the forefront. The smart contract can keep a record of all the ownership rights on the blockchain. The immutability of the blockchain ensures that the data cannot be tampered with, and the smart contract ensures that any change happens only through a completely fulfilled consensus from all the involved parties. Here again, the awesomeness of the transparency steals the limelight. The royalty is paid in real time, and at the same time, the transaction is made available across the entire blockchain, removing even the last-mile hassles involved in accounting. The Internet is no longer confined to interactive devices – it has transcended into the realm of ‘things’, giving birth to the buzz phrase ‘Internet of Things.’ This would mean that even everyday devices that do not need a human instigation can connect to the Internet and communicate with the other areas of the network, including servers, databases, and other devices. If blockchain can do away with human intervention in ‘mainstream’ domains, imagine the relevance of blockchain and smart contracts in a domain that was incepted to attenuate human interventions! Such is the relevance of blockchain in the Internet of Things. Let’s take the example of a parcel which has a considerable probability of getting lost in transit. 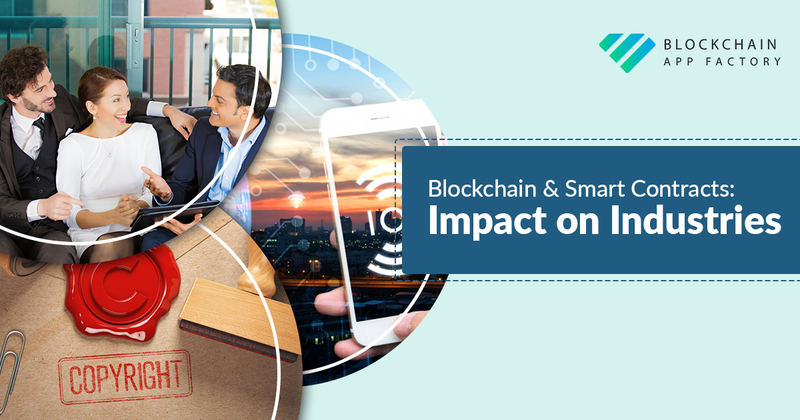 In the IoT-enabled world, the sensors connected to the blockchain – forming its own node – can be placed across key-points of the parcel-transit. Such spots include the warehouse-shelf, the delivery drone, and even your doorstep. A barcode or an NFC chip can be attached to the parcel, which, at every point of the sensor, can record the possession of the tracking-entity. The sensor connected to the blockchain will broadcast the location to all the nodes at every instance, which again, is transparent and visible to all the IoT participants on the blockchain. A simple reverse-lookup gives you the precise position of your parcel, and with the smart contract in place, the instances of fraud are also reduced – there is no way a parcel can pass to a subsequent node by skipping the previous one! What we have seen here is a little tip of the iceberg of the massive deluge of utilities and applications that blockchain and smart contracts can transform! If you would like to stay ahead in the game with your own blockchain application – either Decentralized applications (DApps) or applications build on Ethereum, Blockchain App Factory can bring in its expertise to develop your apps in a way that it constructively exploits all the advantages of the blockchain and smart contracts!